LDR-Light Dependent Resistors may-16-2014 Electronic optosensors are devices that al­ter their electrical characteristics, in the presence of visible or invisible light. 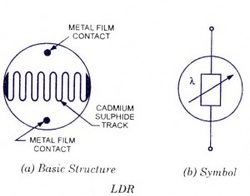 The best known devices of these types are the light dependent resistor (LDR), the photodiode and the phototransistor. Light dependent resistors (LDRs) are made from cadmium sulphide containing no or very few free electrons when not illuminated. Its resistance is then quite high. 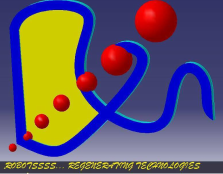 When it absorbs light, electrons are liberated and the conductivity of the material increases. Cadmium sulphide (CdS) is, therefore, a photoconductor. The approximate relationship between the resistance and illumination is R = AE~a where E is illumination in lux, R is resist­ance in ohms, A and a are constants. The value of a depends on the cadium sulphide used and on the manufacturing process. Values around 0.7 to 0.9 are quite common. Device consists of a pair of metal film contacts separated by a snake-like track of cadmium sulphide film, designed to provide the maximum possible contact area with the two metal films. The structure is housed in a clear plastic or resin case, to provide free acess to external light. Practical LDRs are available in a variety of sizes and package styles, the most popular size having a face diameter of roughly 10 mm. LDRs are sensitive, inexpensive, and readily available devices. They have good power and voltage handling capabilities, similar to those of a conventional resistor. Their only signifi­cant defect is that they are fairly low acting, taking tens or hundreds of milli-seconds to respond to sudden changes in light level. Useful practical applications of LDR include light and dark-activated switches and alarms, light beam alarms and reflective smoke alarms etc.